Have you ever been to a book signing? I hadn’t been to a book signing in years, and I heard about Cassandra Clare’s Clockwork Princess book signing at a Barnes & Noble in central LA this past week and thought it would be a fun little literary event. It was fun but definitely not little. The crowd and staff treated Cassandra Clare like a rock star. I would guesstimate that 1200 people waited in line to see Ms. Clare; it was some craziness. Cassandra Clare is the author behind The Mortal Instruments: City of Bones series, soon to be a movie starring Lily Collins (I also found out that the always hilarious Robert Sheehan of Misfits plays sidekick Simon, making the movie that much more awesome). Lily Collins and director Howard Zwart were at Barnes and Noble for the question and answer session before the signing, and authors Maureen Johnson and Sarah Rees Brennan joined Cassandra Clare for the signing. What stuck out most to me during the Q&A was Ms. Clare’s explanation of how, in City of Bones, she “was going for a confluence of the real and the magical,” the idea that coffee shops and warlocks could co-exist on the same street. Everyone I met in the crowd and in line at the signing was super friendly and cheerful (we YA readers must be a good bunch!). One woman had driven down from Visalia (that’s 3 hours without traffic! On a Thursday!) to see Cassandra Clare. I also met the bloggers from Sparkles and Lightning and Tackling Tinseltown – check out their fun blogs. Either plan to swing by the book shop early in the morning to get a wristband closer to the front of the line, or make friends with some employees. We didn’t get our books signed until 10:30pm at a 7pm signing. Yes, that’s a little intense for a school night. Buy/bring books by the mid-list authors that came with the front list author (in this case, the authors I’m referring to are Maureen Johnson and Sarah Rees Brennan). I wish I’d chit chatted with them a bit more about their books and their experiences as YA authors as they were much more available than Ms. Clare, who was busy signing approximately 4 books for each person who came up. Maureen Johnson and Sarah Rees Brennan were super friendly, making jokes and chatting up the crowd as we made our way to the front of the line. Ask more readers in line if they have blogs (I love finding local reading/writing-related blogs!). Since I got two copies of Clockwork Princess signed, DRUMROLL… there will be a giveaway coming up this week! 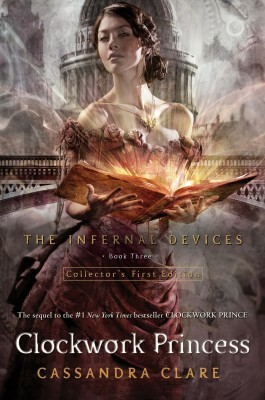 Keep an eye out on the blog this upcoming week for a giveaway of a signed copy of Cassandra Clare’s Clockwork Princess. Have you ever been to a book signing? What was it like? Do you have advice for signings? Posted in Culture and tagged book signings, Cassandra Clare, City of Bones, Clockwork Princess, giveaways, Lily Collins, Maureen Johnson, Robert Sheehan, Sarah Rees Brennan, The Infernal Devices, The Mortal Instruments, ya. Bookmark the permalink.